iFleet provides additional web-based reporting capabilities for the information captured by the iSite and iTank Services. It is included when you subscribe to both the iSite and iTank Services. 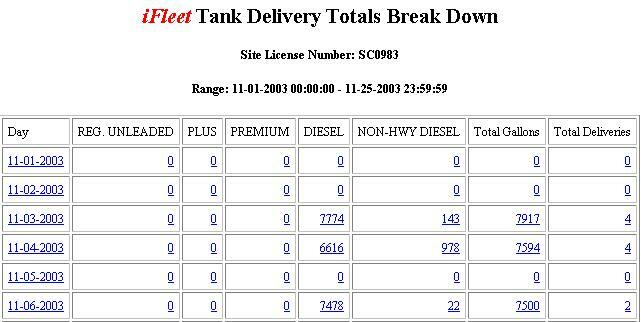 With a click on the iTank status flag on your secure Infinity Site Status page, you can see the current tank inventory at any of your sites including the estimated days/hours until empty and the estimated empty date and time. Empty estimates are based on the sales history captured by iSite, including day of the week variations. A simple click allows you to drill down to see the estimated sales, inventory, and hours until empty for that tank by the hour. The iTank Deliveries Reporting Module provides you with the delivery gallons by product for all of your sites for the time period you specify. You can click on the site to drill down to the site's delivery history, or click on the product, total site, or grand totals of delivery gallons to see the total deliveries by day. The iFleet reporting module also allows you to select the time period of your choice to view gallons usage by product for all of your sites, including site totals and grand totals. You can click on the site to drill down to the individual transactions, or click on the product, total site gallons, or grand totals to see total usage by day.